Pueblo is a city at the crossroads of discovery where history, culture and the arts converge in a powerful display of creative genius. Since its earliest days, the citizens of Pueblo have brought to the fabric of the community a long tradition of exploration, discovery and self-expression. The region has been at the epicenter of opportunity in Southern Colorado since the early 1840s when the first residents built the El Pueblo settlement for trading and commerce. The Arkansas River in Pueblo has been the international boundary with France, Spain, Mexico, and the Republic of Texas, making it a true frontier region in the southwest. After the Colorado Gold Rush in 1859, the city continued to flourish due to its mild winter climate, abundant water resources and extensive agricultural lands. The establishment of Colorado Coal and Iron Company (1881) and later the Colorado Fuel & Iron (CF&I) in the early 1900s ushered in a whole new era of prosperity and soon Pueblo became home to one of the largest steel mills in the world. ‘Steel City’ Pueblo became the symbol and a beacon of hope for those searching for new opportunities in a new land and workers from all corners of the globe traveled to Pueblo and the surrounding communities in order to stake their claim in this new frontier economy of the United States where just about anything was possible if you worked hard. Workers brought from their homelands their unique cultures and traditions and at one time over 26 languages were spoken at the steel mill and mines. Pueblo is the beneficiary of a rich cultural diversity that beckons even today when you visit neighborhoods throughout the city and talk with long time residents. The rush of industrialization over this entire period brought great wealth and arts to the community and city planners and designers built a livable and walkable infrastructure that remains to this day. Arts center executive director jim richerson shares a sneak peek of the rembrandt etchings in the white gallery with visiting consul general el salvador manuel castillo and local international businessman jeff fogg. Pueblo is home to Colorado’s award winning Creative Corridor District where creative industries flourish and you can witness firsthand the power and influence of the arts in the community. Long before the establishment of the Creative District program in Colorado, Pueblo has been at the forefront of engaging the community with the arts. For over 40 years, the inspirational and multi-faceted Sangre de Cristo Arts & Conference Center (1972) in downtown has been a driving force in ensuring that the arts are a part of everyone’s lives in Pueblo and Southern Colorado. The Art Center is complemented by the Pueblo Levee Mural, which is a more non-traditional venue for artistic expression. In 1978 a group of art students converged on the levee waterway which runs through downtown Pueblo and overnight created an art project that has captured the imagination of Pueblo, the art world and even Guinness Book of World Records. The projects cover more than a mile and is recognized as the world’s longest mural. To date more than a 1,000 artists have participated in its development and one can enjoy the art project by walking/bike trail or from the water by kayak. The Pueblo Levee is currently undergoing a major reconstruction to ensure the integrity of the structure for future generations and when completed, the community will have a new canvas to share with the world. 'typing pool' art installation at the gallery in the Steelworks Center of the west in bessemer. Pueblo storyteller gregory howell and local industrial abstract artist randy wix showcase a century of typing machines above pools of water honoring steel workers during 'work and play'. CF& I staffed one of the country's largest in-house typewriter repair facilities along with providing the largest olympic-size swimming pool for workers in colorado. Today Pueblo is experiencing a vibrant renaissance and exciting resurgence of the arts which is witnessed by several new and innovative art initiatives that take full advantage of the city’s rich artistic traditions, affordable cost of living, and an abundance of under-utilized, multi-use historic buildings throughout the entire downtown area. The Shoe Factory, home to local artist studios and galleries, is Pueblo's first member-supported, community-based art atelier which aims to connect artists with the community through education, collaboration and sharing. The artists in residence engage with local schools and organizations through art education and invite those interested to visit The Shoe Factory during Open Studios and First Friday Art Walk. Another exciting new addition to the art destination Pueblo is the creation of The ARTery. The advent of the ARTery in downtown Pueblo in 2013 signaled a new era where existing infrastructure is utilized to create a new type of ‘art walk’ to connect the community with the arts. Historic alleys from the late 1800s in downtown Pueblo form the spine of this new experience which will provide artists with new walls for murals and installation work. The focus of the ARTery is on wellness --- balancing mind, body and spirit --- while combining fitness with local arts and history. In October 2015 the first High Desert Mural Festival will showcase artists from around the United States as they create powerful murals on over 20 buildings along the ARTery in Downtown Pueblo. 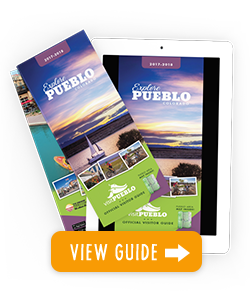 The entire downtown area of Pueblo is filled with art galleries, museums, street sculpture and fountains, cafés, live music, and street performers who are all ready to challenge your imagination and make your visit memorable. The Creative Corridor is focused around the three historic city centers of Pueblo: Downtown Main Street, Union Avenue Historic District, and the Mesa Junction. Each area retains its uniqueness, while providing an enjoyable stroll from one end to the other. The Creative Corridor celebrates the arts each month with the popular and festive First Friday Art Walk and the VanGo Shuttle. El Pueblo History Museum showcases the city's history and the region's many cultural and ethnic groups. The museum includes a re-created 1840s adobe trading post and plaza, and the archeological excavation site of the original 1842 El Pueblo trading post. One-of-a-kind, educational, inspirational, inclusive… the Sangre de Cristo Arts & Conference Center fits all these descriptions and more. Pledging art for all, this beautiful facility has held hands with arts education in Southern Colorado since 1972 and never let go. This is a multi-disciplinary center for the arts located in Pueblo and serves 17 surrounding counties. As an organization, the Arts Center encourages people to bring out the best in others through high-quality art exhibitions, performing arts, dance arts, an award-winning children’s museum, comprehensive arts educational programming, and an artistic space for meetings, performances and events.